True to Size = actual size, not approximate. Size Does Matter! The My Balls Brand of Ball's actual diameter is Truly 2.5" even after normal/natural shrinkage. Not like our competitor's misleading advertisement claimed their 6cm balls are 2.5" but in fact only 2.3" at best after normal/natural shrinkage. Therefore, 78 of our 2.5" balls will fill the same bag packed with 100 of their balls. Are you getting a good value by buying their under-sized balls? Made with Phthalate Free; BPA Free; Lead Free, non-PVC & non-Recycled Plastic. Using a unique 2-stage blow molding process to ensure consistency of thickness; firmness; quality; smooth seam & surface. These Soft Air-filled balls will withstand 90 pounds of weight or pressure. Each ball is molded with the " My Balls by CMS " logo to ensure a genuine product, and individually date-coded for quality control & warranty purposes. Balls were not designed for Pet Use. 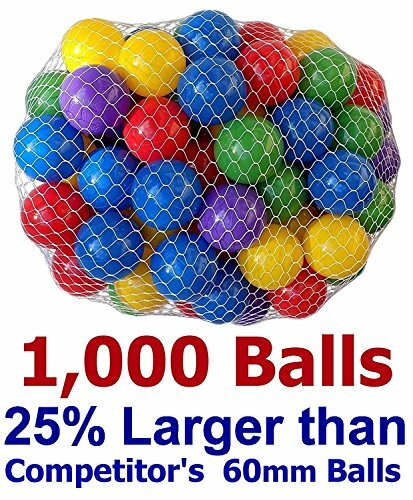 Pack of 1,000 Soft Air-Filled Balls (will give when squeezed, will return back to ball shape when pressure is release) in 5 bright colors - 20 of each in Red; Yellow; Green; Blue & Purple. At 65mm/2.5'' diameter, a perfect size for child's small hand. Great for any ball pit, tent, playhouse, kiddie pool, pack n play, playpen & bounce house. Ideal as replacement balls for Blast Zone, Manley, Toy Quest, Hasbro, Banzai, Little Tikes, Mattel, Playhut, First Step, Step 2 or Intex Products. If you have any questions about this product by My Balls, contact us by completing and submitting the form below. If you are looking for a specif part number, please include it with your message.